I first read one of Paul J McAuley's novels over 20 years ago, picked up completely at random for reason's that are shrouded in the midst of time. The book was Secret Harmonies and it became one of the most memorable novel's I have read before or since, managing to evoke a powerful feeling of travel around a truly alien planet. Since then I have picked up a few more of his books when I have seen them but restrictions on my time have meant that I haven't actually read any of them yet. The good people at Gollancz have been kind enough to send me this novel, the latest he has written which has given me a new opportunity to read a book by this truly gifted story teller. The story follows that the system Formalhaut (one of the brightest stars in our sky) was first colonised by the peaceful and decedant post-human society known as "The Quick", genetically engineered to cope with the alien habitat they established an archipelago of thistledown cities and edenic worldlets within the star's vast dust belt. The Quick were then systematically overwhelmed by an aggressive and ruthless race of "unreconstructed" humans who call themselves "the True", subjugating the post-humans and creating a brutal class-system where the Quick are treated as little more than slaves. Then around a hundred years ago the system was invaded by an advance party of post-human cultists known as the "Ghosts", who destroyed much of the infrastructure and vast digital library before The True beat them back. They have been awaiting their return ever since. Now the Ghosts have come back en-mass, to capture an ancient rogue planet that was captured by the powerful attraction of the Formalhaut star. At this gas giants core is a sphere of hot metallic hydrogen with strange and powerful properties based on exotic quantum physics. The Quick believe that it's a vast alien mind, the True a weapon and the Ghosts a computer so powerful it could reach into their past, collapse timelines, and fulfil the ancient prophecies of their founder. THIS is what science fiction is all about, a powerful story on a vast scale that features far future technology and post-human genetics. The book switches between three different perspectives, two that follow characters of the stories present - both from the viewpoints of the Quick and the True - and one from the pre-formalhaut past. The reasons for this foray into the past we don't really discover until more that a quarter of the way through the book. This is endemic through the novel, the author wastes no time on setting the scene, building back-story or offering too many explanations and we are instead treated as adults and left to enjoy the story - and what a story it is! The minimal amount of information needed is mainly handled through the use of exposition and on the whole this works very well however it does take a little getting used to at first, the pace in the meantime is fairly relentless and I encourage anyone to stick it out - it's worth it. The author manages to describe a post-human colony in such an effortless manner, complete with a whole virtual world where digital demons lurk and can take control or even kill people in the real world if they are connected to the artificial reality. 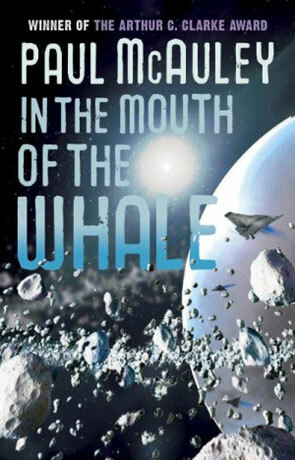 On top of this we have this rich and vibrant system of Formalhaut itself, filled with pockets of self contained civilisation however it's around the gas giant planet that much of the action takes place, where a vast spaceship known as "The Whale" orbits and acts as a stage to research this strange anomaly at the heart of the planet. The two different perspectives set within the Formalhaut system do a very effective job at highlighting how different "clans" of the True treat those engineered Quick (after subjigating them the True now create the infertile Quick as they see fit) and this does vary significantly with some True almost treating them as real people while others as merely lower life forms or even owned objects. Showing the story from these two different perspectives (along with the third set in the past - sort of) gives a great insight into how these quite difference races think and feel, along with just how they are treated. The use of technology in the book manages to avoid the technobabble trap that plagues some scifi books, descriptions are clear and easy to understand without the need for a PHD in physics. The use of the Formalhaut system is an inspired choice, the name itself means "mouth of the southern fish" and it's the first ever solar system discovered to contain an extrasolar planet imaged at visible wavelengths, it is also known to contain a disk of debris orbiting the star. There are some great messages here including the dangers of dogmatic religion, politics and racism. Each of these are well constructed and mentioned without bias, allowing the reader to form their own judgements. I really can't rate this novel high enough, it's a very special piece of fiction by a massively under-rated author, it's easily one of the best novels I have read in a long time - and that includes novels by some of the real heavy-weights. I seriously feel that this should be a contender for a number of the big awards this / next year, it is certainly deserving of any of them (including the Hugo), an incredible future vision that's wonderfully realised and beautifully written, simply stunning fiction. Written on 19th January 2012 by Ant.